This past week I published two essays at The Daily Beast. The first focused on President Trump’s confusing and self-serving address marking the beginning of Black History Month. The vice president’s tweet wasn’t much better, though at least he managed to complete a coherent thought. 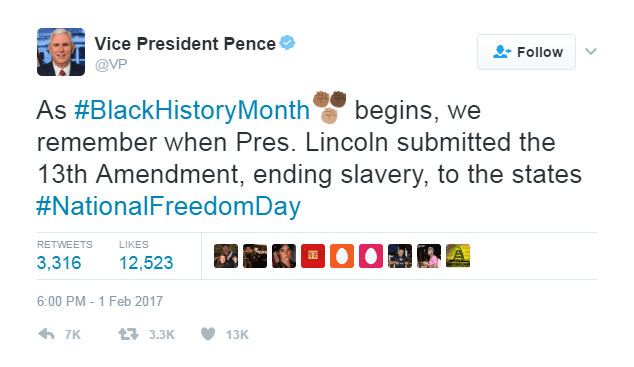 Leave it to Pence to honor Black History Month by tweeting about a white man. I suspect the man’s head would explode if it was suggested that the slaves themselves had something to do with emancipation and the end of slavery. “Boston Defies Trump on Immigrants the Way the City’s Abolitionists Once Fought Slavers” (February 4, 2017) — Correction: Leonard Grimes was a Baptist minister in Boston – not Virginia, which was his birth place – when he successfully purchased Burns’s freedom. As a resident of Boston I couldn’t help but think of the city’s response to efforts to remove fugitive slaves in the 1850s. I am currently working on a piece for Smithsonian about the history of historical markers. Yesterday the image below came through my social media feed, which I thought was perfect timing. This administration is certainly keeping historians busy. Good articles, Kevin. It’s nice to be able to come here and discuss actual facts. Politico has an article up comparing the Muslim ban to the Fugitive Slave Law as a force in converting people to activism. Thanks for the kind words. I think you mean this one, but Joshua Zeitz, which I missed. Yep, thanks for adding the link! 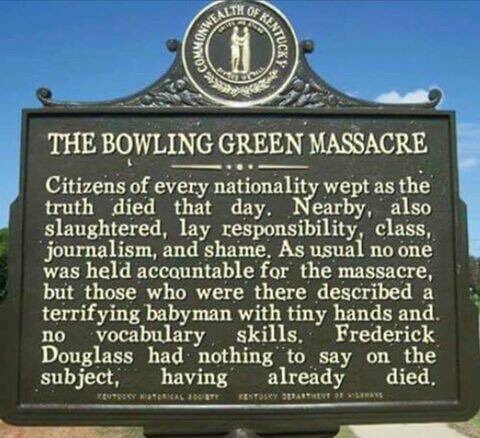 I also saw the Bowling Green Massacre sign! And love it! Isn’t PhotoShop wonderful! It should not come as any surprise that the marker was placed in 1950. 2. A historical marker placed by the DAC in 1967 in South Florida refers to the War Between The States (a point I draw attention to during my tours). Thanks for the additional information. Very helpful. Plus, president do not submit amendments to the states. They got from Congress straight to the states. The Archivist of the US certifies that they had the required 2/3ds vote. The president can not veto, sign, or submit amendments.